Imagine what it’s like to have your liquid products delivered on time—without all the equipment and operator stresses added to your already busy schedule. Imagine how your bottom line, and your day-to-day operations could be improved if you’re free from the burden of looking after your own bulk liquid transfer issues. Wineries, breweries, juice manufacturers, dairies all understand the importance of reliable, efficient and safe bulk liquid transfer. 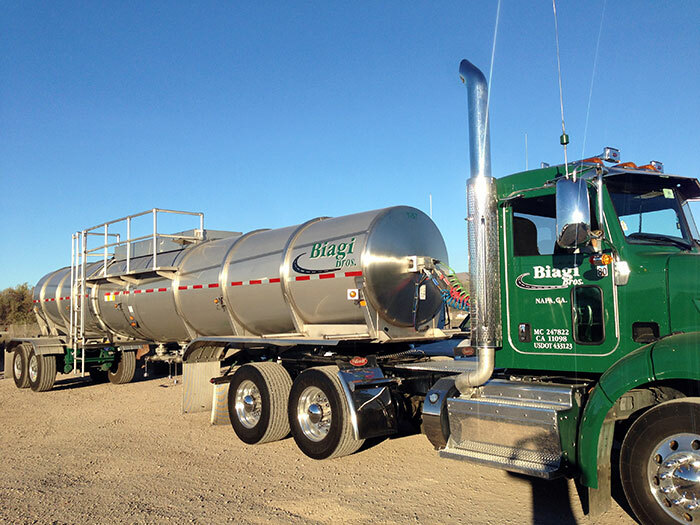 Biagi Bros has a long history with liquid, food-grade transportation, and we have the specially trained drivers and specialized tanks to get the job done safely and on time. In fact, our company got its start transporting bulk wine, hauling barrels and carrying cases of wine to distributors worldwide and to nearby ports for export. Our clients grew and we grew with them. Today, Biagi Bros handles distribution for two of the largest premium wine companies in the world – Fosters Group and Constellation. Would you like help with your bulk liquid transportation issues? How about taking your business to the next level? We have helped many others with bulk liquid transfer and we can help you too. Not just any company is qualified to haul liquid in bulk. There are stringent, but necessary industry regulations to follow. Biagi adheres to industry-wide standards and client-specific procedures. We have the resources to safely ship liquid bulk materials on time. 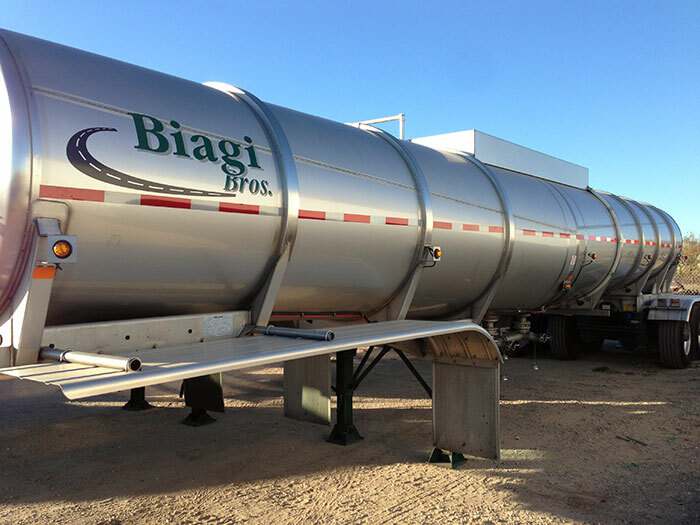 The Biagi Bros’ fleet consists of over 270 tractors, 28 food-grade insulated and non-insulated tankers, and 750 trailers. 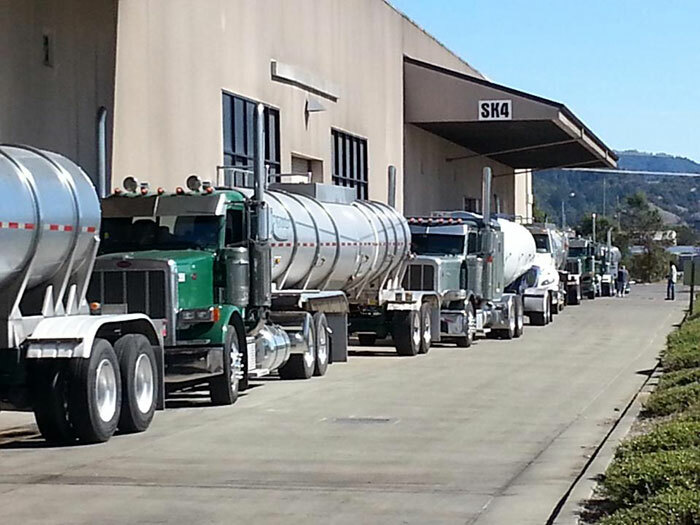 A specialized fleet like ours will help you ensure your bulk liquids are transported safely and on time. You deserve a tailor-made approach, one that matches our resources and strategies to the needs of our clients. Our fleet is flexible enough and has sufficient capacity to serve you even when the volume spikes. To make it easier for you, we find ways to add capacity and reduce costs at the same time. Certified drivers and trained liquid logistics personnel are as important as the special tankers that haul your liquid products. The good news is you don’t have to spend resources on purchasing equipment, training and hiring new employees. We understand the bulk liquid transfer business and we are here to look after your logistics needs. By working with Biagi, you can instantly get access to our pool of skilled professionals – all specially trained for the task. Because of the Biagi Bros’ family-oriented culture, we are able to maintain a high retention rate and attract quality new employees as needed. Problems abound in bulk logistics. You can’t solve them overnight, but you can partner with us and we can help get you on the right track. Instead of spending so much of your time trying to manage your logistics, why not let us go to work for you? We can find solutions to your logistics issues so that you can go back to focusing on your core business. 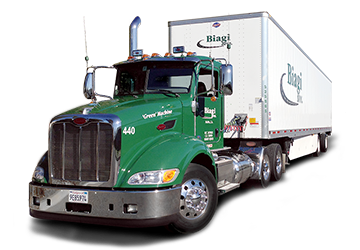 Biagi Bros is a full-service logistics, warehousing, transportation and 3PL provider. Our company serves clients across North America. Talk to us and visit our convenient locations in California (Napa, Van Nuys, Ontario and Benicia) and other locations in Chicago IL, Auburn WA, Tucson AZ, Oklahoma City OK, Houston TX, Arlington TX, Charlotte NC and Jacksonville FL.